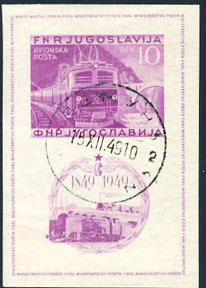 17647 ND YUGOSLAVIA (1949) Electric train*. Imperforate with First Day cancel. Scott No C33, Yvert No BF3. 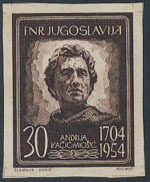 403 ND YUGOSLAVIA (1954) Andrea Kacic-Miosic*. Imperforate. Croatian poet and Franciscan monk. Scott No 416, Yvert No 661.